Next week, the nation’s largest chicken chain (by sales), Chick-Fil-A, will launch a new grilled chicken recipe that it spent seven years and more than $50 million dollars developing. The new recipe is designed to get customers to crave grilled chicken as much as their signature “Southern fried chicken sandwiches”, a tall order to be sure. Chick-Fil-A’s recipe for more healthy, tasty offerings have helped propel the chain past Yum! Brands (the parent company that owns KFC, Taco Bell and Pizza Hut) in total annual sales. The Atlanta-based Chick-Fil-A took in $5 billion last year to KFC’s $4.22 billion and did it with only 1/3 the number of locations. 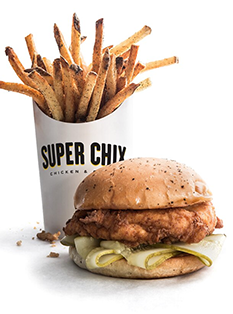 Enter Super Chix, an unassuming, singular restaurant which opened just this week in Arlington, Texas. Super Chix is (hopefully) Yum! Brands’ answer to the seemingly unstoppable, juicy juggernaut that is Chick-Fil-A. With increased pressure from casual fast food chains like Chipotle Mexican Grill, Panera Bread and especially Chick-Fil-A, Yum! knows they need to get crackin’ in order to stem sliding sales. Good, simple food is certainly the best way to turn things around but Super Chix would also give consumers an important choice in the morality department. Chick-Fil-A and its owner Dan Cathy, came under scrutiny in 2010 for his documented support of anti-gay, Christian organizations which sparked several grass-roots boycotts. It’s uncertain if those boycotts hurt Chick-Fil-A or not but the PR backlash was real and probably led to Cathy’s reversal of company policy in 2012. Furthermore, Cathy recently admitted he wants his business to “move past” the anti-gay controversy, leave politics to politicians and focus on expanding the chain’s offerings. Sounds great, but consumers like me have a long memory. If I had a place to patronize that gave me all the delicious chicken goodness of Chick-Fil-A without any of the “holier than thou” attitude, I for one would certainly take it. For the time being you’ll have to visit Arlington if you want to try a Super Chix chicken sandwich, chicken tenders or their creamy frozen custards. I certainly won’t be making a pilgrimage to Texas any time soon, but I will be hoping (not praying) that the test market is successful enough to warrant future expansions. Besides, those adorable cows have hogged the lime light long enough. Go Buy Monument Valley. Now. All hands! Fasten seat belts!